The new unit includes 40,000 sq ft of production space, office accommodation and training facilities. Production of Tank Showers and the Company’s Premium Range of Unheated Showers is now centred on the site together with Fabrication, Stores, Dispatch and Service. Research, development and engineering service, together with the manufacture of other products including Decontamination Equipment and rapid deployment Emergency Shelters remains at the original factory. The increase in production facilities coincides with a major re-organisation of manufacturing and assembly to improve productivity and efficiency leading to shorter lead times from receipt of order to dispatch. 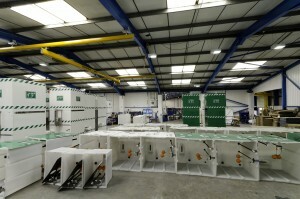 Tank Showers, for example, are now built on a production line and move through separate dedicated assembly zones. A Just-in-Time phentermine online florida strategy from stores to factory floor ensures the efficient delivery of stock materials and components to the manufacturing and assembly areas. At the heart of production management is a computer system that links all aspects of the manufacturing process from receipt of raw materials to dispatch of finished products. It provides more effective control and better co-ordination of resources.